Stunning second single from new Matinée favorites Northern Portrait! Upon release of their debut ‘The Fallen Aristocracy’ EP earlier this year, the accolades started pouring in for this new Danish band: “as perfect as jangling guitar pop can get”… “an instant classic”… “the bar has been set very high indeed”…“these songs are second to none”… “outstanding is an understatement”…“a modern pop classic”…“single of the year!” The EP has topped the Matinée best sellers chart every month since its release with good reason. 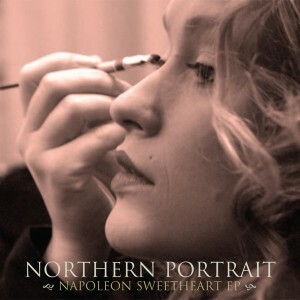 On the highly anticipated ‘Napoleon Sweetheart’ EP, the band worked to expand its sound slightly while retaining the classic appeal of its debut. The brilliant lead track ‘I Give You Two Seconds To Entertain Me’ was the second song ever recorded by the band but has been completely remixed and remastered for this EP. Featuring jangling guitars, keyboards, superb vocals and bright melodies, the song is a three-minute classic inspired by the feeling of being in the wrong place at the wrong time. ‘Sporting A Scar’ is the first of three additional tracks on the EP—thematically close but more self-reflective than the lead track, with especially superb lyrics and more breezy keyboards. It’s another gem! ‘In An Empty Hotel’ is a short and catchy tune about the clash between hopeful dreams and the practical problems that can occur, while the nearly epic ‘Our Lambrusco Days’ is a slightly sentimental and warm ballad with relatively simple instrumentation and open guitar tuning giving the song a special sound. Reviewers of the first EP rightly questioned how Northern Portrait could possibly follow such a strong debut single. The band has responded in brilliant fashion, as ‘Napoleon Sweetheart’ is another solid contender for single of the year. The bar has been set very high indeed. Limited to 1000 copies in custom minijacket sleeve. Californian label Matinée Recordings appears, at least with this release and that of Bubblegum Lemonade, to be looking back to the mid-to-late 80s indie scene, particularly the point where bands would look to fuse 60s influences with punk and post-punk inspirations and ethics. Although the diverse scene would ultimately be lumped together, celebrated and derided as the ‘C-86’ or ‘shambling’ scene by music journalists seeking the ‘next big scene’ (and who would conveniently forget the diversity of many of the bands involved), in recent years this period has been the subject of much interest with a series of re-issues, compilations, websites and celebratory articles. It has also remained a period of influence on a number of contemporary bands as well as labels and club nights. Upon first plays, Denmark’s Northern Portrait and Glasgow’s Bubblegum Lemonade appear to be coming from diametrically opposed ends of the 80s indie spectrum. The former have a rich, elegant sound that speaks highly of the influence of The Smiths and the appeal of good musicianship, while the latter look to the fuzzy, chaotic sound of the Jesus and Marychain and their wonderful, yet often musically inept offspring. Ultimately, though, both The Smiths and the Marychain were, at heart, pop classicists, harking back to better times while looking forward from hard times. Northern Portrait’s sound is very classy and sophisticated, full of neat hooks and twists. Opening song, ‘I Give You Two Seconds To Entertain Me’ – a challenge I immediately threw back at the band and lost – has a neat intro dripping with melodrama from the opening chords and lines: “Shake my arm when it’s over/This whole thing is killing me/I don’t want to be killed.” Driven along by a feisty chiming acoustic guitar and a contagiously catchy tune, the rich, arch vocalist sings of a girl “with a million dollar face” who “doesn’t excite me”. Northern Portrait manage to make ennui and misery sound utterly joyous. ‘Sporting A Scar’ has a beautiful, melancholy feel and an expansive sound. ‘In An Empty Hotel’ wears its Smiths influence most proudly, but it’s a wonderful song in its own right; catchy, inventive and equal parts sordid and defiant as Northern Portrait sing ‘In an empty hotel… We can go down in style’. ‘Our Lambrusco Days’ begins in a subdued, stripped down fashion, full of longing and hurt as it reflects upon a past that cannot be re-captured or possibly never really existed: “I close my eyes/And I am right/Back to those days/Those silly days.” The song builds up into an elegant, world-weary climax. With each subsequent play this record has really grown on me. The songs are rather splendid, the playing and production perfect and any initial traces of cynicism and wariness I first held quickly turned to admiration of and for this E.P. --Is This Music?